Wishing all the readers of Recollecting Nemasket a happy Christmas! If Americans replaced their increasingly obsolete carriages and sleighs with sleek automobiles during the early 20th century, why, too, shouldn't Santa have a shiny new roadster? 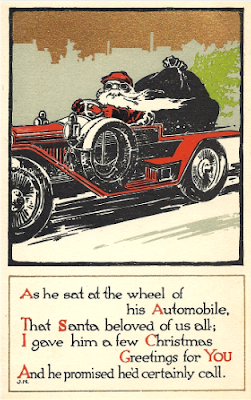 Although seemingly incongruous today, depictions of Santa Claus posed in automobiles of the era were particularly popular at the time, though they became rarer and rarer as the automobile became a ubiquitous part of American culture and sleighs became a nostalgic reminder of the past.